Another draw to look out for? An attractor or a distractor? Do we know what we do not know? I recieved a phone call in the middle of the week from the ANU Harry Potter Society, asking if they could use the large chess pieces that Street Chess look after. They wanted to play Wizard's Chess on the large chess board in Garema Place in Caneberra City. This wasn't a problem I explained, although I suggested they book the chess board itself, as this open space is used for other activities, such as dancing, ice skating, and a lot of political protests. So they turned up on Saturday and proceed to play Wizard's Chess. Now I wasn't playing close attention but Wizard's Chess looked like normal chess to me, although every now and then someone would try and behead a piece with a paper-mache axe, and someone wearing robes would shout "Release the second priest". This went on for a while until the local Christians turned up with their sound system and began to set up for an afternoons preaching. Given the attitude to magic and wizardry that some christian groups hold, I thought this could get pretty interesting. However I assumed that as Harry Potter fans have no actual magical ability, and christians believe that they do, the odds favoured the Christians pretty heavily. And after a few minutes the Harry Potter fans decided to retreat, rapidly clearing the board and packing the pieces away. It turned out that the only thing the Christians needed to say was "God will checkmate you! ", and the HP fans decided that they'd heard enough. There may be a time at some point in the future when Shakhriyar Mamedyarov may be the considered "the guy that changed chess". For now however he is the guy that was defaulted twice in the 2012 European Championship, for two separate reasons. His first default was for a late arrival at the board, falling foul of the instant default rules that is in operation at the European Championships. The second default occurred after he played his round 9 game, when he (and his opponent) broke the 'no draws before move 40' rule that the tournament also has. At this point Mamedyarov, who was the tournament second seed, decided to withdraw from the tournament (and did so in a courteous and professional manner). Both of the rules that he broke are of course still quite contentious. The zero forfeit rule is the one that excites the most passion in the chess community, although ironically, the vote to adopt the rule was supported by a greater majority of the general chess playing public than members of the FIDE Rules and Tournament Regulations Commission (a majority of 1 in RTRC, with the public vote closer to 45-25 at Dresden in 2008). Both rules have been in serious operation for 4 years, and I think this is long enough for a sensible review to occur. One of the main issues I have with both rules is that they can lead to poor outcomes, as they tend to operate in an inflexible way. Of course both rules have clear clauses which allow tournament organisers to modify them, but clearly this doesn't always fir in with the organisers plans. As the FIDE Laws of Chess get a major review every 4 years, the 2012 FIDE Congress is where any proposed changes will be voted on. Before that there will be a counsellors meeting of the FIDE Rules and Tournament Regulations at the end of April in Switzerland. I will be attending that meeting and hope to bring both rules (as well as a few others) up for discussion. Hopefully we will be able to consider the case of Mamedyarov, as well as the report from the organisers, at that meeting. For me I've always preferred a default time of 30 minutes (with the right of the organiser to set another time), and that is the position I will take at the meeting. Some may be surprised that there is such a thing as chess gambling, but it does exist. In fact there were strong suspicions that the final standings of the 2004 Chess Olympiad were affected due to a plunge on one of the teams scoring a big win over a close rival. However the nature of chess makes it hard to gamble effectively on individual games, given the absence of luck. However a variant of Chinese Chess is proving popular with gamblers in Vietnam. The pieces are first covered with plastic cups and then placed at random on the traditional starting spots on the board (I assume the General and his Guards start on their normal spots). The pieces remain covered until *after* their first move. For their first move they are moved as though they are the piece that belongs on the starting square, but after they are uncovered, they move as they are supposed to. This of course adds the element of luck that makes gambling worthwhile. While it has become popular in Vietnam, for some government officials it has become too popular, with a number of high profile arrests for gambling related embezzlements. The Calvin Ayre gambling blog has more detail on this new form of wagering. FM Junta Ikeda has wrapped up first place in the 2012 ANU Masters with a full round to spare. He defeated Miles Patterson after the Patterson dropped a piece trying for complications. The win left him 1.5 points in front, with 1 round left to play. IM Andrew Brown did his best to stay in touch after a win over Harry Press. In an exciting game Brown sacrificed a piece and 2 rooks to end up with a second queen, but Press missed a winning defence when under pressure, and possibly resigned the final position a little early. Andrey Bliznyuk looked to have the upper hand against Jeremy Reading, but the loss of a key pawn allowed Reading to reach a double rook ending a pawn up. However one pair of rooks came off and once Bliznyuk reached Philador's Position, a draw was the correct result. WIM Arianne Caoili continued her good run at the right end of the tournament with a quick win over Ethan Derwent, in a game played earlier this week. Another to add to my catalogue of games or play when you both need a draw. Or is it? This game was played at the European Championships between two players from Armenia. Certainly the first part of the game follows established theory, and the end of the game is a draw by perpetual, but is the middlegame all home analysis as some have claimed. I'm not completely convinced, as White seemed to have alternative ways of drawing after move 20. And online opinion also seems divided, with some pooh-poohing the whole game, while others subjecting it to serious analysis. We are coming to the end of Daylight Savings in Australia, and this can't come soon enough. Waking in darkness may be something that Europeans are used to, but I prefer the sun shining through my window when the alarm goes off. Of course this also means that Daylight Savings is just starting in Europe, although this has already caused some problems. A number of players (7 I believe) forfeited their games in the European Championships in Bulgaria, after turning up late for the round on Sunday. I pretty sure that there would have been plenty of announcements the round before, but clearly these went unheard. Blame is also being sheeted home to the organisers for using the 0 minute forfeit rule, but even if they had changed the default time to anything other than 1 hour (as they are perfectly entitled to do), the players may have lost anyway. Having recently updated my mobile phone to something more modern, I find myself presented with a huge choice of apps to enhance my lifestyle. Having started with my usual search for chess apps, I've now moved on to other types. In fact my phone upgrade coincided with a the gift of an iPad for Christmas, so I'm looking for apps all over the place. One app I do like is CardioTrainer, which is an exercise management package. While the only real exercise I do is walking, it is still nice to keep a log of the places you walk (via the GPS). It also supports a large number of exercise activities, including one marked 'Custom'. It was this setting that got me thinking. Rather than just use it for physical exercise, I'm going to try and adopt it for mental exercise. Using the scheduling feature, I plan to try at least 2 x 30 minutes sessions of tactics training each week. I'll probably use ChessTempo as the training tool, although I may also dig up some old software I have. The only drawback is my phone can't actually measure how many ELO points I gain (or lose), but I should be able to log that manually (even if it thinks it is calories!). A possible entry for oldest recorded game. It was played around 1485 and pre-dates any entries I have in my databases. My source for the game is the book "The Golden Treasury of Chess" by Francis Wellmuth. The author says the game comes from a Catalan manuscript, where the score is contained in a poem. While the game is of a fairly low quality (both sides overlook tactical tricks) it at least was played with the modern rules (Queen and Bishop fully mobile), although I'm not sure the fact that neither side castled is significant. For some reason I thought I had already posted the diagrammed position, yet for some reason I cannot seem to find it in my archives. 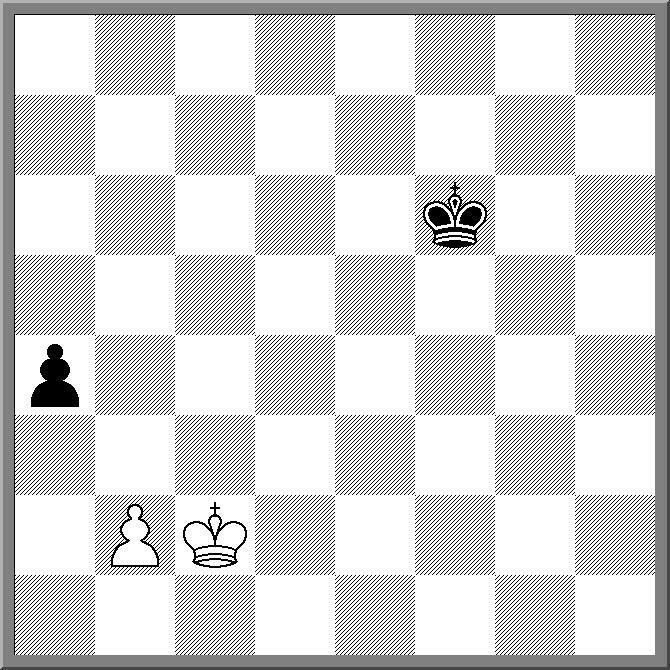 It is a study by Dedrle from 1921 and its solution contains almost all the essential features of King and Pawn endings. I'm not going to post the solution yet, but if you make the effort to solve it (assuming you aren't already familiar with it) it will help you understand some of the paradoxes in K+P endings. I do show it to some of my coaching groups, but I normally save it till the end, after they have mastered some more fundamental positions. It is White to play and win. This years European Chess Championship has started in Plovdiv, Bulgaria. Like previous years it has attracted a very strong field, with over 100 GM's! Many in the 2600+ category. Top seeds include young guns Caruana and NegiGiri, plus the usual host of eastern Europeans. One thing I've noticed at the other end of the field is the smaller number of chess 'tourits' (players under 2000). I could only guess the reason for this, but possibly the idea of spending two weeks as cannon fodder does not make for an appealing holiday. The tournament website is www.eicc2012.eu allthough www.chessdom.com are also covering the tournament (including live games with compute analysis). Round 7 saw the top 4 seeds in the tournament paired up. Tournament leader FM Junta Ikeda was up against 2010 winner Andrey Bliznyuk, while WIM Arianne Caoili played IM Andrew Brown. Both games were hard fought contests, and at one stage it looked as though the tournament front runners might come unstuck. Although her Grand Prix Attack did not gain Caoili any advantage from the opening, Brown's oddly placed knight on h6 proved to be his undoing. A tactical shot in the middle game allowed Caoili to win a piece, and although Brown did get a couple of pawns for it, the ending proved winning for his opponent. Bliznyuk looked to have a good position in his game against Ikeda, and even won a queen for rook and piece. However he did not feel this was enough and went on the defensive. This allowed Ikeda to make threats and the win of another piece was all it took. In the other game of the evening Miles Patterson defeated Ethan Derwent. The game started as a Benko Gambit declined, and for the first half all the action was on the queenside. The Derwent decided to go after Patterson's king, but in doing so weakened his own kingside. 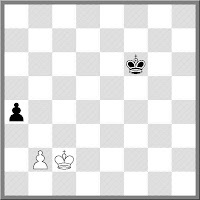 It then became a matter of whose king would get chopped first, and Patterson was able to deploy his pieces more effectively. Derwent resigned when faced with forced mate. With two rounds to play Ikeda seems to have an unassailable lead. He is 1.5 points ahead of Brown, with the rest of the field too far back to catch him. The New York Times has an article on a better approach to dealing with claims of computer cheating in chess. IM Kenneth Regan has developed a system that compares the game played with how a computer would play it. But unlike the simplistic, and often wrong, x% of moves match Fritz/Shredder metric, Regan has built up a model that also relies on the relative strength of the player. He has done this by getting computers to analyse thousands and thousand of games, and then matching the 'correct' choices to the strength of the players. Apart from looking at a couple of interesting cases (including the Sebastien Feller case), he has also come up with another conclusion. According to his model, the 40th ranked player today plays at the same strength as Karpov did in the 1970's! Hopefully Regan will be able to continue his work in this area, as a system for dealing with claims of cheating in chess would be a boon for organisers and officials, especially where the claim is without foundation. IM George Xie scored a picket fence in winning the 2012 Dubbo Open. Xie had to work a little harder on the second day, playing seeds 2 (Michael Wei) and 3 (Don Keast) in successive rounds. Wei felt he missed a chance to draw in his 4th round game, while in the 5th round Keast was up a piece at one point. There was a curious incident in this game when Keast started a combination that should have left him with a winning position. Having played the first move he left the board to get a drink, while Xie sunk into thought. When Keast returned, he mistakenly believed that Xie had played a move, so sitting down he played the next move of the combination. There was a kerfuffle as Xie wanted to know what was happening, and I (the arbiter) intervened. Keast apologised for the misunderstanding, I added 2 minutes to Xie's clock, and the game continued. While the combination proved sound (and Keast was a piece up), the advantage was only temporary as he returned the piece a few moves later, when he played the wrong defensive move. After that Xie went on to win, and finished the tournament with a win over Neil Clark in the final round. Wei and Keast met in the 6th round, with Wei winning to take a share of second, alongside Fritz Van der Wal, who benefited from a Col Parson's blunder. Apart from the Open, the club also held a lightning event the previous evening, with Don Keast winning for the second year in a row. As it was a time handicap event, Keast needed to bet Jingming Chow in the final round, and despite starting with 1m v 5m on the clock, did it with 5 seconds to spare! Three players lead the 2012 Dubbo Open after the first 3 rounds. Top seed IM George Xie had a couple of quick wins on his way to 3/3. Second seed Michael Wei also scored 3 wins, but had to fight a lot harder for his points. They were joined by Don Keast, meaning the the top 3 places are held by the top 3 seeds. The turn out of 28 players was lower than last year, and the absence of the normally large Canberra contingent was the main reason. Nonetheless the tournament attracted players from all over the Central West, as well as New England and the NSW North Coast. There was also a good turn out of junior players from Dubbo and Wellington, with unrated Nikhil Rajesh being the surprise packet, winning his first two rounds (against Neil Clark and Norm Greenwood). Tomorrow the top two seeds clash in the fourth round, while Keast plays Mike Canfell on board 2. This is my yearly report on my trip to the Lifeline Bookfair (Canberra's traditional second hand book sale). Some years the chess pickings are fairly slim, but in other years there is plenty to choose from. Fortunately this year is a year of bounty. I was able to purchase about a dozen books to add to my collection, with a number of interesting and surprising finds. One such find was Hans Berliner "The System". This is a somewhat controversial book, as Berliner proposes a system of play (especially in the opening) which he believes invalidates a couple of well know openings. Interestingly the copy I purchased had a number of hand written notes (by an unknown yet recognisable hand), which dispute Berliner's claim. There was also a copy of "Chess is my Life" by Korchnoi, "Practical Chess Endings" by Keres, as well as a selection of Reinfeld/Fine/Horowitz which turn up at any second hand book sale. I also scored two books which had a chess/ computer science crossover. They were Botvinniks "Computers, chess and long rang planning" and "The Mathematical Theory of Communication" by Claude Shannon and Warren Weaver. For those that are interested, the book fair continues tomorrow and Sunday at Exhibition Park in Canberra. As I will be heading off to Dubbo very early tomorrow morning you'll even have a clear run at whatever I've left behind. FM Junta Ikeda has maintained his lead in the 2012 ANU Masters, although it has been reduced to half a point. Martijn Van de Pol held Ikeda to a draw, holding a tricky ending with both players short of time. This result allowed IM Andrew Brown to close the gap, after he defeated Ethan Derwent. Miles Patterson continued to perform above his rating, drawing with Andrey Bliznyuk. Avoiding his usual English Opening, Patterson kept the position even throughout, and the game ended with a drawn bishop of opposite colours ending. Harry Press defeated Jeremy Reading, scoring his first win of the tournament. Press sacrificed a pawn to gain the initiative, and after Reading missed a couple of good moves in the middlegame, Press was able to reach a winning ending. A full crosstable for this event, as well as a pgn file of games is available from the ANU Chess Club website, under the current tournaments link. I've been trying to get my head around the whole visual.ly thing (for those who don't know it is a website about graphical representation of data). While it all looks nice, and it is clear what they are trying to do, I'm still working out how to do it. Of course if I made the effort to do a bit more research I would probably be able to answer my own questions. For the moment they only seem to have two chess related graphics. The first is the Thinking Machine map (which I've blogged about before), while the second is about the who, why, how and how many people play chess. It is produced by chess.com and it is an interesting read (although the J in Judith Polgar went missing at some point). If you want to check it out, click on this link. When coaching new players, it can be difficult to convince them of the advantages in castling. Going through the the usual benefits (king safety, developing the rook) seems to work, until you move onto more fun stuff like how to check mate your opponent. If you coach like me, this topic usually consists of a number of short, exciting games where the loser gets hacked by a kingside attack, (ie after they've castled). So despite telling them that castling is about king safety, all they see is a place where the king goes to die. And I've had plenty of comments from my students to back this up. So the following game should definitely not be used to show the benefits of castling. While castling was not the losing-est move in the game (taking the knight on g5 was), castling at least lost a pawn for Black. With the h file open, and a bishop eyeing h7 all White had to do was play the mating attack in the right order. He was even able to choose between 13.Qxf7 and 13.Ne4, as both of them led to mate. The rise of the Super-GM tournament is now causing problems for players it is supposed to benefit the most. Up until the late 70's most big GM tournaments consisted of a group of very strong GM's (normally a World Champion Candidate or two), some lower level GM's and strong IM's, and some local players to round it all out. In the 1980's this began to change, as tournament organisers tried to create stronger and stronger events. Since then the it is the elite Round-Robins that dominate the scene, with a select group of events for the very top players (usually half or dozen of the top 10 per tournament). While this is good news for these players, in terms of competition and income, it has created a scheduling problem. The 2012 FIDE Candidates tournament has caused angst for the organisers of the London Chess Classic and the Bilbao Masters, as it is scheduled to be held between these two events. As the likely field for each tournament has a significant overlap the fear is that players will be forced to miss one or two of these tournaments. It is of course is now a question of priority. Do the players (and sponsors and spectators) continue to support the existing events, or do they support the World Championship cycle (a cycle that the leading players have asked to be improved on a number of occasions)? Of course they could try and support both, but this may have a detrimental effect on their level of play in each event. There has been a small buzz around the issue of dress codes in tournaments, brought on by the European Women's Championship in Turkey. The sanctioning body, the European Chess Union, has a dress code for its events. It is in use for the current Womens' Championship, and will also be enforced at the European Men's Championship next month. While there are plenty of places discussing it I'll just link to The New York Times coverage of it. While there are probably good reasons for having a dress code, and not having one either (I'm on the side of not enforcing one btw), most of the complaints seemed to be aimed at the requirement for players to "button-up". At most only the top two buttons can be undone, which seems to concern some male commentators, who feel such a restriction will drive people away from chess. Now I probably should give them the benefit of the doubt and assume they are saying that chess players like to dress casual, but I can't help thinking there is some other rational behind their angst. However I'll wait to see what is said about the issue during the Men's championship before I pass final judgement. Last year I blogged about the Halasz! Opening, and today at Street Chess it made a re-appearance. Filling the role of the House-Man (a person who plays to remove the bye from a tournament), I was paired against Matt Radisich, Canberra's leading (only?) exponent of the Halasz! Despite the cry of "Halasz!" on move 3, the opening did not work in his favour and I was 2 pawns up. It was at this point I decided to attack one of his knights with my h pawn, but just as my pinky began to push the pawn to h6 I realised the knight could simply take my rook for free. "Arbiter!" he cried as I retracted my finger. "Yes, I have to move the pawn" I replied in my dual role of player and arbiter and completed the move. The rook was captured with some good natured ribbing, but that wasn't the end of it. "Of course I will now insult you by not resigning" was my next comment, and the game continued. Now I'm not sure whether it was the pressure of playing on a rook up, or the voice in the back of his head going "There is no way you can lose this", but a combination of lackadaisical moves and some positional compensation for me (two good bishops to start with, followed by connected passed centre pawns), saw the game slowly unravel for Matt, until I won back enough material to end up with a better R+P ending. And at this point he had had enough and resigned (quite cheerfully I must add). While it was all played in good spirits I still feel a little guilty. If it had happened to an opponent rated above me I would have resigned on the spot. The fact he was lower rated was the only reason I chose to play on. So while the fact that I won seems to justify my decision, I still think it is a little unfair for lower rated players to be treated differently than higher rated players. But what say you? I attended the funeral of Richard Langdale-Smith earlier this week. Richard was an active player at the Tuggeranong Chess Club around 10 years ago. I was the only chess player at his funeral, which wasn't that much of a surprise,although it was one of the largest funerals I have attended in recent times. Why I say it wasn't that much of a surprise was that Richard was a fairly unassuming chess player, although this hid who he really was. Apart from playing at Tuggeranong he was also a regular at the Saturday morning coaching sessions Peter Simpson and I ran. While the coaching was open to all ages, Richard, who was in his 60's at the time, would find himself surrounded by 9 and 10 year olds. However he did not mind this as he was well aware that learning can happen at any age. And it was this love of learning that was revealed in his background. Rather than just being a 60 something chess player struggling to break 1200, he was much more than that. He was born in England in 1935, and had an early interest in chemistry. Upon leaving school he went to University and completed a Doctorate in Organic Chemistry. He moved to the United States and was a researcher in pharmaceuticals until his mid 30's (as well as being a skier and white water rafter). He then decided upon a change of career, and following in the footsteps of his parents, decided to become another sort of doctor, enrolling in medical school in Canada. It was here he met his future wife, Gill, and after he completed his degree, moved to Australia, where she came from. He then spent 15 years as a GP in Leeton, NSW before settling in Canberra in 1994. He then rekindled an earlier love for chess and became a familiar part of the local chess scene. And it was here that I met him, a man who was both a medical doctor and a Phd, sitting happily amongst a group of kids, learning yet another skill. It was a night for upset victories in the 5th round of the 2012 ANU Masters. With Junta Ikeda away in Vietnam, IM Andrew Brown took the opportunity to join him on 4 points with a win against Miles Patterson, the only result that went according to rating. Ethan Derwent made it two wins in a row after beating an out of sorts Sam Grigg. The pairing of WIM Arianne Caoili and Jeremy Reading brought together two TV stars (Dancing with the Stars, Beauty and the Geek), with Reading winning a game when Caoili misplayed her attack. In the longest game of the night, Martijn Van de Pol used the London System with great effect to bet Andrey Bliznyuk. After sacrificing a pawn in the middle game, Van de Pol had enough weak points to target, winning back the pawn and taking a clear advantage into the ending. There were a couple of stalemate tricks to avoid at the death but once they were avoided Bliznyuk had no choice but to resign. After 5 rounds Ikeda and Brown share the lead on 4 points, although Ikeda has played one less game. With his win last night Van de Pol moves into a share of third with Miles Patterson on 3 points. The entry list for the 2012 O2C Doeberl Cup is starting to fill up, with the number of entries passing the 100 mark. More importantly there are only 28 spaces left in the Premier section, and these are filled on a first come, first served basis. The field for the Premier has also passed the milestone of overseas titled players, meaning that title norms on offer do not depend upon playing a minimum number of overseas players. There are 10 GM's and 10 IM's in the field, with 21 players from foreign federations. As in previous years the Major, Minor and U/1200 tournaments are a little slower to fill, but that should change shortly. Given that you *cannot* enter on the day then there is no difference between entering now and at the last minute. You can enter at the O2C Doeberl Website, as well as see who else has already entered. Once again tournament T-Shirts can be ordered off the website, and like entries, this needs to be done in advance. No good seeing everyone else wearing one and finding you've missed out! Chess is about thinking, which often leads us to spend time thinking about thinking. Nonetheless the sort of thinking required in chess seems pretty straight forward, and most chess players can recognise the shortcomings in their own thinking. Or can we? I read an interesting article tonight which suggests that quite possibly we aren't smart enough for most things. It was framed in terms of politics and what sought of candidates get elected, but the gist of it is, if we have gaps in our knowledge, then we are unable to asses those gaps in our knowledge (ie we don't know what we don't know). Having read the article the observations seem obvious, although that may just be the little "everybody else is an idiot" voice in my head. And I'm not sure it applies to chess players, as we are able to asses what extra knowledge can bring, due to a reasonably objective measuring system (the results of games). The article is here if you wish to read it. And I'll leave you with an observation I read on a chess forum a while ago "If you think an idea is stupid it is because you are either really, really smart, or very, very dumb"
Mikko Markkula, Chairman of the FIDE Qualifications Commission passed away on the 1st of March. This is very sad news as Mikko was both a friend and colleague of mine, in the brief period that I knew him. I first met Mikko at the 2008 Chess Olympiad, and he listened patiently to my queries on titles, as we shared a few breakfasts together. He had an encyclopaedic knowledge of the FIDE title system, which was especially important, as a number of title applications had to be processed under the rules that were in effect at the time. We met up again at the 2010 Olympiad where he was a constant presence in the Technical Administration office, helping us out with pairing issues, as well as regaling me with his enormous collection of jokes. Apart from chairing the QC, he was also the secretary of the Swiss Pairings Programs Committee. He was also a highly regarded arbiter, both in his native Finland as well as in FIDE events. He will be missed by all, and his knowledge of FIDE regulations will be hard to replace. FM Junta Ikeda was very light on his feet after his 4th round game in the 2012 ANU Masters. He played that game on the evening of the 29th of Feb and the next day headed of to Vietnam to play in the 2nd HD Bank International. Fortunately the first two rounds were on the 2nd of March so he had at least 1 day to recover. Joining him in the 9 round swiss are fellow Australian players IM Moulthun Ly and Peter Frost. After 3 rounds Ly is on 2/3 and Ikeda is on 1.5 although they both played GM's in the third round. If you want to follow the results then here is the link, and from there you can click on the link to the Vietnam Chess Federation page which will have further tournament coverage. While this blog is 'mainly' about chess, it isn't 'all' about chess. So I'd thought I bring you some video that was taken at the Australian National University (ANU), where I work. Running through the ANU is Sullivan's Creek, which most of the time is so meagre that you can jump across it. However it is fed by the stormwater drain system of North Canberra, so given enough rain, it can actually resemble a real creek. This quite a rare occurrence, so when it happens, some students feel the need to take advantage of the situation.In the attached video a surprisingly large number of students pulled out the rubber dinghy's and headed down the drop near the School of Law. Now I'm not condoning their actions, and I'm sure they themselves recognised the dangers, but I'm sure most people have seen Sullivan's Creek in flood and said to themselves "Wouldn't it be fun to try ..."
The 2012 ANU Masters saw a surprise spectator this week, with World No. 2 Lev Aronian dropping in to support his girlfriend WIM Arianne Caoili, who is playing in the tournament. Despite his encouragement, Caoili lost a hard fought game against tournament top seed FM Junta Ikeda, in 80 moves. Ikeda found a tactical shot that won a pawn, but Caoili had enough counter play to win it back and reach an equal ending. However, with both players under a minute on the clock, Ikeda pushed for a breakthrough and managed to create a passed pawn that could not be stopped. Sam Grigg had the unenviable match up against his housemate, IM Andrew Brown. Playing much too quickly, Grigg found himself in a poor position and lost in 28 moves. Miles Patterson continued his good start to the event with a win over Martijn van de Pol. Patterson held the initiative for most of the game and van de Pol eventually ran out of time. Ethan Derwent went home happy after scoring his first win of the tournament. Getting the sort of position he is comfortable with against Jeremy Reading, he was able to generate a few threats but a tactical oversight by Reading allowed Derwent to win a piece and the game. After 4 rounds Ikeda leads the tournament with 4/4. Patterson and Andrey Bliznyuk share second on 3 points. A full crosstable and games are available for this event at the ANU Chess Club website. Despite being an atheist, I've decided to make a sacrifice for Lent. I've decided to forgo the use of chess engines when I am playing through my games, and most other games I'm adding to databases. I've realized that I've lost my 'board vision' and am losing the ability to assess positions, especially when I am looking at random games in tournaments. Maybe it is just a function of age, but I suspect that relying on the little numbers on the bottom of the screen are a contributing factor. So unless I really, really need computer assistance ( eg for magazine work) I'm going to muddle my way through, like in the pre computer age. Hopefully this will result in a small improvement in my play, but if not, at least I can say I tried.